AUCTION LOCATION: 9703 Alesia St. South El Monte, CA. Ravne mdl. EDE100-1450- 650 1000kN (112 Ton) Hydraulic Stamping Press s/n 100-L- 19 w/ Pendant Controls, 150mm (5.9”) Stroke, 30-90 Strokes/Min, 80mm (3.15”) Adj., 440mm (17.32”) Die Space, 1450mm (57”) x 650mm (25.59”) Bolster Area. 2005 Sutherland Auto Stamper mdl. CPG1000 100 Ton Hydraulic Stamping Press s/n 200503002 w/Quickpanel Pro-Face Touch Screen Controls, 1150mm x 700mm (45.27” x 27.56”) Slide and Bolster Areas, 900mm x 600mm (35.43” x 23.62”) Ram Stroke, 634mm (24.99”) Open Height, 175mm (6.89”)Shut Height, 30 Ton Cushion Cap, 485mm x 330mm (19.09” x 12.99”) Cushion Pad, Hydraulic Quick Change Die Clamping, Light Curtain. Nugier mdl. C-25 25 Ton Hydraulic C-Frame Press s/n 1182001 w/ 15” x 24” Bolster and Ram Areas. Denison Multipress mdl. FL35-30HC592EHWICR5616 Hydraulic Press s/n 25405 w/ 20” x 30” Bolster Area (NEEDS WORK). Strippit Custom 18-30 Fabricator Punch Press w/ Sony DRO, Glass Scales, Fabricator Arm, 3” Die Head,Fence System and Acces. Keetona mdl. HUF 818474 100” x 1/8” (14GA) Hydraulic Box and Pan Folder. AR Tools mdl. WC67Y-35/1800 35 Ton x 71” Hydraulic Press Brake w/ 71” Bed Length, 8 ¼” Throat, 4-Position Die Base. Little Scotchman mdl. 3902A Dvorak Iron Worker s/n 71576 w/Punch, 12” Shear, 4” x 4” Corner Notcher, 2” x 2” Angle Shear. Metal Muncher mdl. MM-70 70-Ton Iron Worker s/n 035791098 w/Punch 1” Thru 7/8”, Flat Shear 1” x 7”, ¾” x 12”, 3/8” x 20”, ¼” x 24”, Angle Shear 4” x 4” x 3/8”, Coper-Notcher 3” x 3” x 3/8”, (NEEDS HYDRAULIC UNIT). Pexto mdl. 418-F 16-18GA x 48” Power Roll s/n 2/59 w/ 3” Rolls. Pexto Motorized Circle Shear (FOR PARTS). Vidmar and Lista Tooling Cabinets w/ Punch Tooling. 1997 Acer Dynamic 1760G 17” x 60” Geared Head Gap Bed Lathe s/n 97050473 w/ Programmable DRO, Taper Attachment, 50-1800 RPM, Inch/mm Threading, Tailstock, Dorian Tool Post, 12” 4-Jaw Chuck,Coolant. Okuma Type LS 21” x 64” Geared Head Gap Bed Lathe s/n 4206-11566 w/ 35-1800 RPM, Inch hreading, Tailstock, Steady Rest, Indexing Tool Post, Coolant. Honden “Concord 1550” mdl. HD1550 15” x 50” Geared Head Gap Bed Lathe s/n 0175 w/ 25-2000 RPM, Inch/mm Threading, Taper Attachment, 2” Thru Spindle Bore, Tailstock, 8” 6-Jaw Chuck, Coolant. Sairyo mdl. 1743 17” x 43” Geared Head Gap Bed Lathe w/ 35-2000 RPM, Inch/mm Threading, Tailstock, 5C Collet Closer, 12” 4-Jaw Chuck, 10” 3-Jaw Chuck. Webb mdl. 17G X 40 17” x 40” Geared Head Gap Bed Lathe s/n7809-15 w/ 32-1800 RPM, Inch Threading, Tailstock, Follow Rest, Indexing Tool Post, 12” 4-Jaw Chuck, 17” Face Plate. Goodway mdl. HDL360 14” x 42” Geared Head Gap Bed Lathe w/ 55-1800 RPM, Inch/mm Threading, Tailstock, Trava-Dial, 8”3-Jaw Chuck. Clausing mdl. 6913 14” x 48” Lathe s/n 602643 w/ 43-1650 Dial RPM, Inch Threading, Tailstock, 7 ½” 3-Jaw Chuck. Hardinge HC Hand Chucker s/n HC-4635- S w/ Threading Attachment, 125-3000 RPM, 8-Sation Turret, 5C Spindle, Power Feeds, Coolant. (2) Hardinge mdl. HC Hand Chuckers s/n’s HC-2654G, HC-2632G w/ 125-3000 RPM, 8-Station Turret, 5C Spindle, Power Feeds. Warner &amp; Swasey No. 3 mdl. M-2200 Turret Lathe s/n 1948026 w/ 45-2262 RPM, 6-Station Turret, Cross Slide, 12” 4-Jaw Chuck, 8” 3-Jaw Chuck, Coolant. Bridgeport Series 1 – 2Hp Vertical Mill s/n 195320 w/ 60-4200 Dial RPM, Power Feed, 9” x 42” Table. Bridgeport Vertical Mill s/n 109248 w/1.5Hp Motor, 60-4200 Dial RPM, Power Feed, 9” x 42” Table, Dumore Series 24 Automatic Drilling Unit, 6” Angle-Lock Vise. Bridgeport Vertical Mill s/n 160339 w/ 1.5Hp Motor, 60-3000 Dial RPM, Power Feed, 9” x 42” Table. Clausing Kondia mdl. FV-1 “Power Mill” Vertical Mill s/n U-949 w/ Heidenhain DRO, 60-4000 Dial RPM,Chrome Ways, Power Feed, 9” x 48” Table. Clausing Kondia “Power Mill” Vertical Mill w/ 60-4250 Dial RPM, R8 Spindle, Power Feed, 9” x 42” Table. Saimp mdl. FV-0 Vertical Mill s/n 1981 w/ TVA-1 mdl. S Auto Vertical Head, 400-2500 RPM, 8-Speeds, 30-Taper Spindle, Box Ways, 10” x 44” Table, 8” Machine Vise. Cincinnati “Toolmaster” Vertical Mill w/ 85-3800 Dial RPM, 40-Taper Spindle, Box Ways Power Feed, 10”x 42” Table. Supermax Vertical Mill s/n 841212493 w/ Pathfinder DRO, 2Hp Motor, 80-2720 RPM, 9” x 42” Table. Webb mdl. 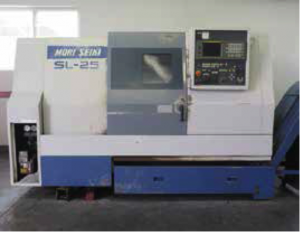 2S Vertical Mill s/n 791622 w/ 80-2720 RPM, 8-Speeds, 9” x 42” Table. Index Vertical Mill s/n 555-10675 w/ 9” x 46 ½” Table. Cincinnati “Cinova 80” mdl. 307-14 Universal Mill s/n 31423U5V-6 w/ 25-2000 Horizontal RPM – 50-Taper Spindle, 100-1530 Vertical RPM – 50-Taper Spindle, Box Ways, Power Feeds, 14” x 62 ½” Table. Cincinnati mdl. R-78 10” x 32” Automatic Cylindrical Grinder s/n 27569 w/ Cincinnati Controls, Motorized Work Head, 56-480 RPM, Center, Coolant. Norton 10” x 30” Automatic Cylindrical Grinder s/n 24693 w/ Auto Cycles, Motorized Work Head, Motor Speed Controller, Center. Landis Type IR 10” x 20” Universal Grinder s/n 835-97 w/ Motorized Work Head, Center. Landis 4-H Plain 4” x 18” Cylindrical Grinder s/n 798-19 w/ Motorized Work Head, Center, Hydraulic Wheel Dresser, Coolant. Landis 4-H Plain 4” x 18” Cylindrical Grinder s/n 651-10 w/ Motorized Work Head, Center, Coolant. Heald mdl. 273A Automatic Universal ID Grinder s/n 43627 w/ Sargon DRO, Wheel Dresser, 12” Dia. Magnetic Work Head Chuck, Motorized Work Head, 0-500 Dial RPM, 90 Degree Adjustable Work Head Angle. Heald mdl. 273A Automatic Universal ID Grinder s/n 43388 w/ Wheel Dresser, 12” Dia. Magnetic Work Head Chuck, Motorized Work Head, 0-500 Dial RPM, 90 Degree Adjustable Work Head Angle. Heald No. 72A Universal Grinder w/ Motorized Work Head, 12” 3-Jaw Work Chuck, 8” magnetic Chuck, Heald Red Head ID Grinding Head. Heald mdl. 271 Plain Automatic ID Grinder w/ Auto Feeds, Wheel Dresser, (NO CHUCK). Timesavers mdl. 125-1MW 24” Wet Belt Grainer s/n 18858 w/ 24” Belt Feed, Coolant Pump and Filtration. (2) Bryant No. 1116 Universal Grinders (NEEDS WORK). Square Deal mdl. “Polishing Lathe” Pedestal Buffer s/n 1101 w/ 1500-3000 Adjustable RPM. Amada mdl. HA-250 10” Automatic Hydraulic Horizontal Band Saw s/n 452909 w/ Amada Controls, Hydraulic Clamping and Feeds, Conveyor, Coolant. Peerless mmdl. 1200M Horizontal Band Saw s/n AM66-400- 66 (NO BLADE GUIDE ARMS). Powermatic mdl. 87 20” Vertical Band Saw s/n 1-2029 w/ Blade Welder, 37-4500 FPM, 24” x 24” Table. Powermatic mdl. 87 20” Vertical Band Saw s/n 7987075 w/ 24” x 24” Table. DoAll mdl. H-S 15” Vertical Band Saw s/n 5-50174 w/ 20” x 20” Table. DoAll mdl. V-36- 3 36” Vertical Band Saw s/n 37-51106 (FOR PARTS). Ingersoll Rand mdl. N75A/C 75Hp Rotary Air Compressor s/n NV7114U05320 w/ 145 Max PSIG. Sullair mdl. LS-16- 75H-WCAC- 24T 75Hp Rotary Air Compressor s/n 003-142041 w/ 62,775 Hours. Sweco “Vibro-Energy” Media Tumbler w/ 28” Tub. Falls Products mdl. 113 “D-BUR- R” Edge Deburring Machine s/n 2018. 4-Head Gang Drill Press w/ Delta and Rockwell Drill Heads, (2) Procunier Tapping Heads, 23” x 54” Table. Trinco mdl. 48X24SL Dry Blast Cabinet s/n 18072-0. Avey Size 3 Deep Hole Drill Press s/n 30564w/ Power Quill Unit, 25” x 34” Table. Greenerd No. 3 Arbor Press. OGP Optical Gaging Co. “Opticon Qualifier 30” mdl. 0030S 30” Optical Comparator s/n 00300-340 w/CLIP Controls and DRO, Surface anf Profile Illumination, 10X, 20X, 31.25X, 50X, 62.5X and 100X Magnification. Jones &amp; Lamson 14” Floor Model Optical Comparator s/n E42007 w/ Quadra-Chek Programmable DRO. MicroVu 14” Floor Model Optical Comparator w/ MicroVu MD-1 Programmable DRO, Surface Illumination 5” x 18” Table. Clark CGX-40 8000 Lb Cap LPG Forklift w/ 3-Stage Mast, Side Shift, Cushion Tires. Clark 8000 Lb Cap LPG Forklift w/ 3-Stage Mast, Side Shift, Cushion Tires. Clark C500-70 5250 Lb Cap LPG Forklift s/n 685-0077- 6871KQF w/ 3-Stage Mast, 199” Lift Height, Side Shift, Cushion Tires. Clark CGC25 4625 Lb Cap LPG Forklift s/n C365L-0510-9393FB w/ 3-Stage Mast, 189” Lift Height, Side Shift, Cushion Tires. Big Joe mdl. PTR-40 Electric Pumping Cart s/n 321824 w/ Pump, 350 Gallon Storage Tank, Built-In Charger. (317) Corelite mdl. (22”)R3-WL- 2N5-1DUNV-22 22” x 22” Recessed Florescent Lighting Fixtures. (116) Focal Point mdl. FV2-S- XPSL-215- 1C-DS- C48-WH8’ and FV2-S- XPSL-277- 1C-DS- C48-WH8’ 8’ Florescent Lighting Fixtures.